Metal Gear Solid: The Twin Snakes is a stealth action video game. 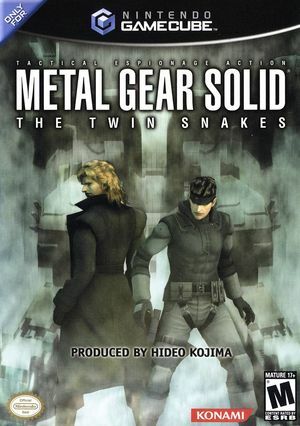 The Twin Snakes is a remake of Metal Gear Solid, developed and first published by Konami in 1998. The Twin Snakes features graphical improvements over the original, new cutscenes written and directed by Ryuhei Kitamura, and gameplay functions originally introduced in the sequel Metal Gear Solid 2: Sons of Liberty. The game also includes a revised translation with re-recorded voice acting using most of the original English voice cast. The backdrop of the codec screen that zooms in on Snake requires XFB set to real. While Virtual will display it correctly after setting it to Real, this only lasts for one loading zone, then you would have to toggle Real again to make Virtual work again. In order to avoid the bug altogether, enable XFB Real. This is a minor defect, and enabling XFB Real causes the game to render at native resolution, so use at your own discretion. Fixed with Hybrid XFB in 5.0-5874. Make sure to set Aspect Ratio graphics setting to Force 16:9 when using these Gecko codes. The graph below charts the compatibility with Metal Gear Solid: The Twin Snakes since Dolphin's 2.0 release, listing revisions only where a compatibility change occurred. 3.0 Windows 7 AMD Phenom II 1055t @ 3.5GHz AMD Radeon HD 6870 Fully Playable 55-60FPS with very minor visual artifacts on some cutscenes. Sound is buggy most of the time, even when using the LLE engine. HLE sounds better during general gameplay but LLE fixes the crashes during cutscenes. Using DX9 with with cache display lists and OpenMP texture decoder enabled. r7690 Windows 7 Intel Core 2 Duo T9400 NVIDIA GeForce 9800M GTS No Problems, but only 35-60FPS! 3.0-739 Windows 7 AMD FX 4100 @ 4.22GHz NVIDIA GeForce GT 520 Full speed gameplay with accurate vbeam emulation enabled. FPS 59.9-60FPS at all times with no decrease, 1600x900 resolution and default settings The issue where sound skips/cuts out during cutscenes can be fixed by either using DSP LLE or changing the backend to Xaudio2 if you want to use HLE Emulation. 3.0-844-newaxhle Windows 7 SP1 Intel Core i5-2500K @ 3.7GHz NVIDIA GeForce GTX 580 1.5GB Perfect emulation, no crashes, full speed the hole time. MMU speed hack needed to boot correctly into the game. EFB copies to RAM not texture to fix thermal goggles issue. Disable widescreen hack to avoid double images in cutscenes. Important: to avoid sound cutoffs, do the following: VBEAM accurate emulation turned ON in rom settings DSP recommended: NEW AX HLE 3.0.844 Framerate limit to: Audio not Auto(with "Limit by FPS" turned on to avoid audio faster than video as in lips desynched with audio). Audio backend: XAUDIO2 If still experiencing sound stuttering, try PAL version of the game, have tried both NTSC and PAL, and Pal is better in regards of avoiding sound stuttering. ONLY slowdown is in cutscenes that have real footage but there are only four of them and they are short. This page was last edited on 13 December 2018, at 01:48.